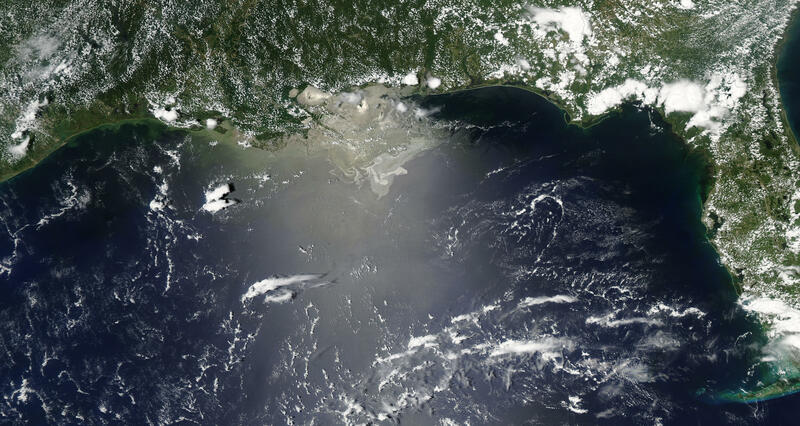 Located squarely in the sunglint part of this photo-like satellite image from Saturday June 26, 2010, the oil leaking from the damaged Deepwater Horizon well in the Gulf of Mexico was easily visible when the Moderate Resolution Imaging Spectroradiometer (MODIS) on NASA’s Terra satellite viewed the area. Silvery-gray streaks and patches of oil are visible across a wide area. Oil changes the way the water reflects and absorbs sunlight, making the Gulf look brighter in some locations and darker in others. Photo-like images are not a perfect tool for mapping oil slicks, however. Some variations in brightness may have natural causes, such as the muddy, freshwater runoff from the Mississippi River. In addition, oil may be undetectable if it is located outside the sunglint region. 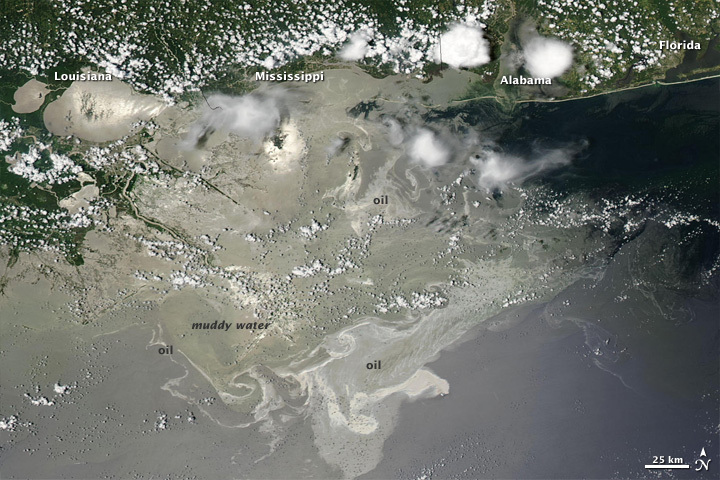 Silvery-gray streaks and patches of oil are visible across a wide area in this image from June 26, 2010. On April 20, 2010, an oil rig explosion in the Gulf of Mexico left nearly a dozen workers missing and started a large fire. Oil remained visible on the surface in late July.